This paper argues that despite the initial favourable conditions such as Uttar Pradesh’s location in the fertile Indo-Gangetic belt, implementation of land reforms, a legacy of a unified administration under British India, a diversified base of traditional and modern industries and a political leadership which carried weight in the national political establishment after independence, the state could not build up the momentum of growth and development and thus continued to remain as laggard state. The gap between state’s per capita income and national income widened over the years. Various political regimes in Uttar Pradesh could hardly make any significant dent on accelerating the growth and development process despite their agenda of social development. UP’s comparatively better growth story in the 1970s and 1980s can broadly be understood in terms of a spread of agricultural growth to the agriculturally poor regions, which was supported by public policy, along with higher industrial growth, the concentration of which in the western region was sustained partly by higher levels of agricultural development in that region and in other regions by public investment and industrial incentives. But in later years, the state could not accelerate agricultural growth to higher levels and failed to bring about more dispersed and accelerated non-farm growth despite avowed focus on such growth. The regional disparities within the state tended to widen with concentration of poverty in eastern and central regions. The performance of the state on human development front was less than satisfactory. 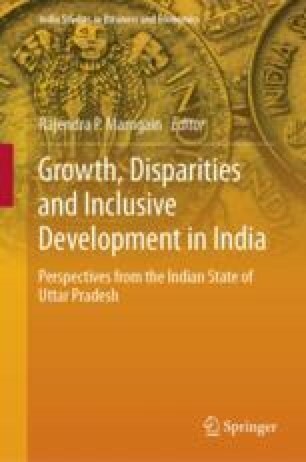 The authors argue that successive governments of various political parties in Uttar Pradesh could hardly step up the rate of inclusive growth over and above the rest of the country. The industrial development of the state tended to concentrate in few regions along with languishing micro and small enterprises in the state. Agriculture continued to suffer from lacklustre policy approach, particularly in eastern and Bundelkhand regions, thereby affecting the livelihoods of those depending on this sector. The special development package for Bundelkhand region could not make the desired impact on the development of the region. In terms of social policy, the Bahujan Samaj Party (BSP) and the Samajwadi Party (SP) have followed an agenda which has purportedly been more tilted in favour of Dalits and Muslims or Muslims and OBCs. But small-scale production, which forms the economic basis of livelihoods of Muslims and OBCs, has languished in the state. Large-scale corruption and inefficient implementation have limited the benefits of social protection programmes. This has prevented UP’s growth from being inclusive, even by the lacklustre national standards. Overall, UP’s position among Indian states in terms of human development indicators remains virtually unchanged. This paper is published earlier in Economic and Political Weekly, Vol. LI, No. 53, 2016, pp. 32–43. The editor of this book is thankful to Economic and Political Weekly for permitting him to reprint the paper in this volume. Abhiyan, S. (2015). Bundelkhand drought impact assessment survey 2015. Retrieved on September 6, 2016 from https://static.swarajabhiyan.org/content/news/prod/145/bundelkhand%20survey%202015_v05.pdf. Dreze, J., Khera, R., & PEEP Team. (2014). A peep at another India. Retrieved on November 5, 2016 from http://gap2015.org/downloads/A_peep_at_another_India.pdf.